Tactile and PC-based touchscreen scales for smart and fresh department solutions! Keyboard or touchscreen, fresh product weighing or expanded applications for visual sales promotion on the customer display: METTLER TOLEDO’s wide range of retail counter scales has something for every grocery retail business need. Consumers are spontaneous and make buying decisions at the service counter. That is why METTLER TOLEDO retail counter scales actively support your staff in servicing and advising at the point-of-decision. 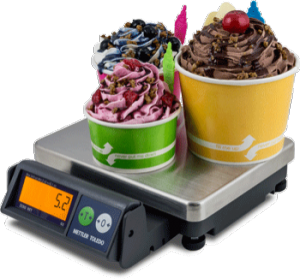 METTLER TOLEDO counter scales – far more than weighing. The compact design of the UC Evo Line scales helps save space at the sales counter. Avoid an unnecessary barrier between sales staff and customers and enable employees to access items on the sales counter quickly and easily. Fast, interactive and extremely easy to operate: the adjustable touchscreen offers exceptional ergonomics and comfort when searching for items and selecting functions. This allows employees to work without strain, and ensures fast, error-free weighing and operating processes, even at peak times. The UC-CWQ Evo CT features a 12.1” color LCD SVGA touchscreen with LED backlighting. Standard features include a 1.86 GHz Dual Core Intel ATOM processor and a color LCD VGA customer display. The color touchscreen is responsive and easy-to-use, benefiting operations where high turnover and training may be problems. Select from the classic or the enhanced graphical interface. Preset keys can be configured as text or graphical. Setting up the UC in graphic mode is easy and comes with an extensive food photo library. Color LCD SVGA operator touchscreen with four adjustable positions. Use the 1/4 VGA color customer display for graphics and special merchandising messages. Displays and prints member pricing for enhanced merchandising. Enhanced Label Printing – more graphics and prints unique label shapes. Fast Intel® ATOM processor to run third party software. Connects to standard 10/100 MBPS Ethernet networks. Switchable between English, French, and Spanish. The ultimate marketing tool. The UC-CWT Evo CT is ideal for retailers wanting to increase sales and maximize the return on their investment. Through dynamic product marketing, the UC-CWT Evo CT facilitates more personal associate and customer interaction, right at the scale. The fast professional processor and 12.1” SVGA color LCD customer display makes every transaction a superior shopping experience. Fast, interactive and extremely easy to operate: the adjustable touchscreen offers exceptional ergonomics and comfort when searching for items and selecting functions. This allows your employees to work without strain, and ensures fast, error-free weighing and operating processes, even at peak times. Transitioning to a new, more capable counter scale has never been easier — or more affordable. 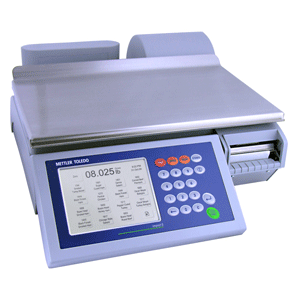 METTLER TOLEDO’s Impact M is the most advanced counter scale in its class. It offers the accuracy, easy operation and rugged construction you need for years of worry-free use — even in the busiest fresh departments. From its precise weighing technology and large label roll, to the high-resolution label graphics and full-color, state-of-the-art touch user interface (the largest in its class), the Impact M delivers unprecedented long-term value. Best of all, the Impact M integrates smoothly with most existing scale networks, and is supported by METTLER TOLEDO’s intelligent device management tools and our extensive network of service professionals. Interactive and easy to operate: the bright 10.4-inch touchscreen improves weighing convenience and speed at the service counter. Staff productivity can be enhanced and training time reduced through easy access to thousands of preset PLUs, along with direct entry of PLUs for fast retrieval. The Impact M touchscreen scale is suitable for use both at the service counter and as a self-service scale. Its easy-to understand graphical user interface with touchscreen operability ensures that your customers will soon become captivated with the self-service concept. Make use of the scale’s large screen to communicate product and brand-related advertising as well as special offers directly at the POS. Scrolling text, graphics or images on the customer display will engage shoppers and boost your sales. The Impact S programmable network counter scale features an easy-to-use touchscreen/tactile keyboard combination. From the multi-interval load cell and state-of-the art user interface to the large label roll and high-resolution label graphics, the Impact S is designed to deliver unprecedented value. When paired with our remote service tools such as Windataback, and our network of service professionals, the Impact S provides outstanding total cost of ownership. The bPro Counter Scale is the scale you need at an affordable price. Packed with professional features, bPro will exceed performance expectations without straining your budget. At METTLER TOLEDO, we understand the complexities of the retail business. That’s why we created bPro, a scale that you can choose today with the confidence of knowing that it will perform well for many years. When you purchase a bPro you will be able to make it easier for your employees to do their jobs, market to your customers in new and innovative ways, and minimize operational costs while saving money on every transaction. All for an affordable price. Customers enjoy using our technology because it makes shopping so much easier. Our innovative, full-color self-service touchscreen applications can make a tremendous difference in your marketing efforts. The UC Evo Line of self-service scales put the control in the hands of the shopper. Fresh product self-service scales are convincing sales assistants that are intuitive, fast, and simplify the shopping experience. UC Evo Line self-service scales are available in different models, ranging from the entry-level to high-performance touchscreen scales with applications which make shopping an enjoyable experience for your customers. Over 70% of produce department sales come from random weight goods. Self-service is a way a retailer can improve their bottom line without increasing staffing levels. 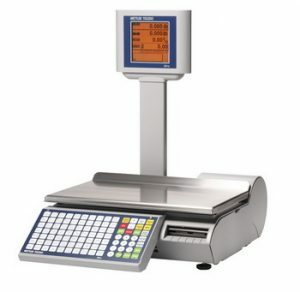 The UC-GT Evo CT is ideal for retailers wanting to offer customers maximum convenience from their self-service scales. The fast, professional processor and 12.1” SVGA color LCD customer display makes every transaction easier for your customers. The compact design minimizes the counter space required, and puts the color display in a prominent position right in front of your customer. Fast, interactive, and easy-to-operate. The large color touchscreen and graphical user interface offers your customers the ultimate in convenience when choosing products. This means fast and problem-free weighing on self-service scales even at peak times resulting in a more pleasing shopping experience. The UC-GT Evo CT can be strategically integrated into daily sales promotions when it is not in use weighing product. The display can be used as a sales tool to display text, images, or video for product presentations, recipe suggestions, or special offers. Product information can be offered to your customers along with recipes, tips, or ingredients information. The large touchscreen is the perfect platform to deliver this information to your customers. The UC-GT Evo CT compact design reduces the space required for a high-performance scale. The slim and elegant design fits perfectly with modern and contemporary store designs. Daily maintenance is easy thanks to the durable and easy-to-clean surfaces. The UC-CWT Evo CT is ideal for retailers wanting to increase sales and maximize the return on their investment. Through dynamic product marketing, the UC-CWT Evo CT facilitates more personal associate and customer interaction right at the scale. The fast professional processor and 12.1” SVGA color LCD customer display makes every transaction a superior shopping experience. The compact design of the scale helps save space at the sales counter, avoids creating an unnecessary barrier between sales staff and customers and enables employees to access items on the sales counter quickly and easily. With the UC-CWT Evo CT you can increase turnover through targeted sales promotions for both food and non-food items. Whether it’s gourmet week, a salad dressing tip, or promotions for unusual foods from around the world, the UC-CWT Evo CT stirs up your customers’ appetite and puts your offers in front of the customer with the attractive 12.1” customer color display. Fast, interactive and extremely easy to operate: the adjustable touchscreen offers exceptional ergonomics and comfort when searching for items and selecting functions. This allows your employees to work without strain, and ensures fast, error-free weighing and operating processes, even at peak times. The UC-CWQ Evo CT is loaded with features that will help improve your operation and boost sales. The UC-CWQ Evo CT can promote your brand and products on the color LCD customer display. It is capable of impressive visual branding to help drive sales. With extensive support for custom logos, pre-printed designs and complex layout requirements, UC-CWQ Evo CT prints labels that reinforce store brands and help build shopper loyalty. 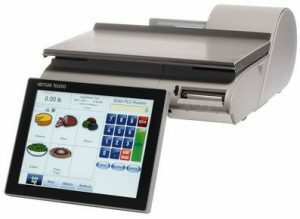 Whether providing hygiene information, keeping staff up-to-date with new regulatory policies, providing expert advice about recipes, or offering information about ingredients and their origin: the touchscreen is the perfect platform for innovative staff training and providing customers with valuable tips during the sales process. Stimulate targeted purchase incentives for lucrative extra revenue – in both food and non-food areas. Whether gourmet week, salad dressing tips, or a tasting tour: with the bright customer display, the UC-CWQ Evo CT whets your customers’ appetites for your products. Build loyalty with customer-friendly self-service solutions. The large color touchscreen and graphical user interface offers customers the ultimate in convenience when choosing products. This means fast and problem-free weighing even at peak times, resulting in a more pleasing shopping experience. The UC-CWQ Evo CT is available with an optional barcode scanner which can capture the GS1 Databar as well as most other standard barcodes. Barcode scanning virtually eliminates product identification errors and allows the retailer to link multiple vendors to the same PLU, improving support of inventory/category management and traceability initiatives. Update your self-service operations with the affordable Impact M scale. Featuring a full-color touchscreen, the Impact M is the most advanced scale in its class. It offers the accuracy, easy operation and rugged construction you need for years of worry-free use — even in the busiest self-service departments. The Impact M touchscreen scale is suitable for use both at the service counter and as a self-service scale. Its easy-to-understand graphical user interface with touchscreen operability ensures that your customers will soon become captivated with the self-service concept. Checkout scales must meet the highest standards in reliability and speed. At the same time, they are exposed to rigorous use and risks that could cause damage – from liquids to dirt to foreign objects. Ariva checkout scales mitigate these risks with an exceptionally robust design that protects the interior of the scale and the weighing mechanics from operational problems. 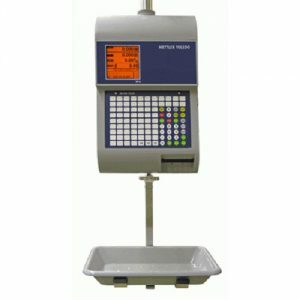 All Ariva checkout scales are compatible with the METTLER TOLEDO VCODisp (Virtual Checkout Display) application, bright weight only display, and bright price-computing display. Retailers who weigh at the cash register can display cash register and weighing information together on the cash register monitors. This means there is no need for a separate scale monitor, creating more space and visual simplicity at the checkout. The Ariva checkout scales connect to most point-of-sale systems for checkout applications, and to personal computers for many other applications that require weight data. The Ariva checkout scales are available in three designs – for use with bioptic scanners, for installation of horizontal scanners, and as a stand-alone scale without scanning. A number of popular scanners are supported, including models from Datalogic, NCR, Motorola/Zebra Technologies and Honeywell. Ariva checkout scales offer enhanced customer service, thanks to their exceptional transaction speed. This means fast weighing processes without extended wait times in the checkout line. The checkout line is the last stop in a shopper’s visit, which can make or break the shopping experience. Give customers what they want – speed. 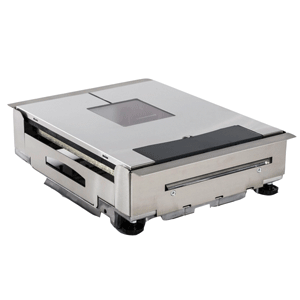 Retailers get the accuracy they depend on, as the Ariva checkout scales offer a fine weighing resolution of 15 lb (6 kg), up to a large weighing capacity of up to 30 lb (15 kg). 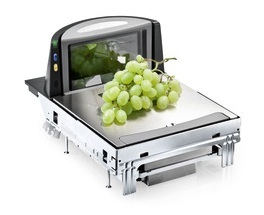 The dual interval weighing modules from the Ariva-B range for installation in bi-optic scanners are the ideal solution for retailers with a wide product mix, who require a maximum permitted load of up to 15 kg as well as a very fine weight resolution for light, expensive goods. Thanks to their robust design, which efficiently protects the inner workings from dirt or liquids, the Ariva-B weighing modules withstand even the toughest requirements of day to day operation at the cash register. The Ariva is integrated with Honeywell, NCR, Motorola/Zebra Technologies, and Datalogic scanners. Ariva checkout scales guarantee perfect customer service, thanks to their exceptional transaction speed. This means fast weighing processes without wait times in the critical area around the cash register as well as a high level of comfort throughout the process for checkout staff. Improved connectivity and simple commissioning – Ariva checkout scales are equipped with a USB interface as standard. Certified METTLER TOLEDO service technicians carry out installation and adjustment quickly and safely. Checkout scales are exposed to rigorous use. The inner workings and weighing mechanism of the Ariva checkout scales are effectively protected from dirt and liquids by the robust design. 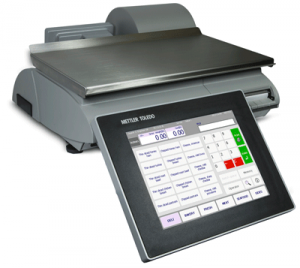 Each model in the range of Ariva checkout scales uses the same software. This simplifies the integration of scales to checkout systems and makes system maintenance in environments with several devices easier. Horizontal scanner for flexible weighing at the checkout Fast. The Ariva-H horizontal scanner scale is the METTLER TOLEDO checkout solution for retailers with the most stringent demands. The Ariva-S delivers what you want – complete accuracy along with reliable and durable performance. 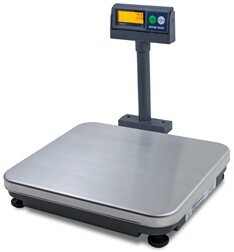 This scale connects to most point-of-sale systems for checkout applications, and to personal computers for many other applications that require weight data. Available as a countertop model or with the option to build into the counter, the Ariva-S has a robust cast aluminum housing and stainless steel platter, enabling it to meet even the toughest requirements of day-to-day operation at the cash register. The Ariva-S dual interval scale is the ideal solution for retailers who require both a high capacity, up to 30 lb (15 kg), and a fine weight resolution for light goods. Ariva checkout scales provide fast weighing and exceptional transaction speed to reduce customer wait times. This is critical around the cash register, improving customer service, and increasing efficiency for sales personnel. Your business depends on checkout scales being ready for use at all times. The Ariva’s robust design provides protection against dirt and liquids for many years of dependable performance. decision with minimal impact on the environment. Small footprint, big impact: The Ariva-S-Mini delivers reliable and durable performance with the smallest counter footprint in its class. It takes up 64% less counter space than the Ariva-S. 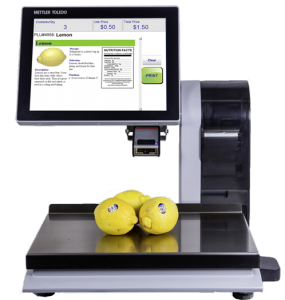 The scale connects to most point-of-sale systems for checkout applications, and to personal computers for many other applications that require weight data. The Ariva-S-Mini has a robust cast aluminum housing and stainless steel platter. This dual interval scale is the ideal solution for retailers who require both a high capacity, up to 30 lb/15 kg, and a fine weight resolution for light goods. The Ariva-S-Mini’s compact design maximizes counter space, benefiting both operators and customers. The smallest counter scale in its class, the Ariva-S-Mini provides the same features as the larger Ariva-S model with a much smaller footprint. Your business depends on checkout scales being ready for use at all times. The Ariva-S-Mini’s robust design provides protection against dirt and liquids, for many years of dependable performance. The Ariva-S-Mini checkout scales are available in pound (lb), kilogram (kg) or ounce (oz), with various capacities, and your choice of single or dual intervals. These scales are available with RS232 or USB connections. Ariva-S-Mini checkout scales are very conservative when it comes to power consumption. Along with proven longevity, more efficient power supplies and recyclable packaging, Ariva scales are a good business decision with minimal impact on the environment. The bPro Hanging Scale is the scale you need at an affordable price. Packed with professional features, bPro will exceed performance expectations without straining your budget. At Bison Food Equipment, we understand the complexities of the retail business. That’s why we created bPro, a scale that you can choose today with the confidence of knowing that it will perform well for many years. When you purchase a bPro you will be able to make it easier for your employees to do their jobs, market to your customers in new and innovative ways, and minimize operational costs while saving money on every transaction. All for an affordable price. bPro makes it easy for operators to change labels and store managers to adjust product information. The patented “Light Touch” keyboard and 140 preset keys ensure fast transactions. 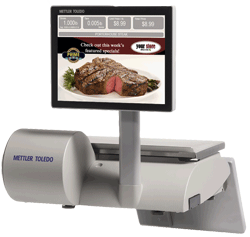 Graphic displays and a logical menu structure make navigating the scale easy. Included software simplifies managing scale item data and label graphics. Precise, high resolution tare values reduce the amount of weight attributed to tare, recovering several dollars per day in lost profits. bPro’s intuitive user interface means you can train employees quickly, reducing training costs. User-friendly item management software is included that saves time by enabling you to update all your scales at once. Increase sales and build customer loyalty by running promotions on bPro’s graphic customer display. Reinforce important marketing messages to customers with bPro’s custom label formats and graphics on its high-resolution printer. bPro has the capability to support many popular features, including Nutri-Facts, Safe Handling instructions, Frequent Shopper programs, and more.